I'm afraid my review here will be brief - the book is due back at the library today and, to be honest, I've been distracted by a very sick cat and haven't had the time or inclination to focus on reading. 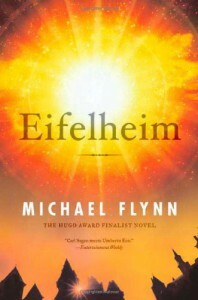 That said, overall I found Eifelheim an interesting book and would recommend it. As other reviewers have noted, it's a parallel story: The first part is set in the "Now," where Tom, a historian, and his lover, Sharon, a physicist, are pursuing the elusive answers to mysteries. In Tom's case, it's why the village of Eifelheim (nee Oberhochwald) was abandoned during the Black Death but never resettled; in Sharon's, it's the TOE ("theory of everything"), the Holy Grail of modern physics. It turns out the answers are related. The second story (IMO, the more interesting) takes place in the aforementioned Oberhochwald from 1347-1349, and recounts the First Contact between humans and the Krenk. Flynn's evocation of Medieval society is brilliant, and his characters are fully developed and distinctive, including the aliens. There is an overreliance on coincidence to move the story along (especially in the "Now" chapters), which diminished my enjoyment of the story, but I did like the philosophical debates and found a kindred soul in Father Dietrich, the village's priest.